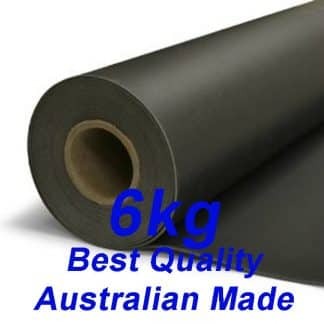 6kg/m2 Mass Loaded Vinyl, Heavy Duty flexible acoustic barrier for walls, floors, ceilings, cars, boats & truck linings. 1350mm wide * 3 meters = 4.05m2. If You find the same item at a better price from another vendor, we will refund the difference! Simply provide written details of the company / website and the price. Offer excludes trade discounts, offers not available to the public, offers in conjunction with other promotions or purchases, or special 1 off promotions. Please note: you will be responsible for covering the cost of return shipping! 6kg/m2 Mass Loaded Vinyl, or NuWave Base 6kg/m2, or just MLV, is a Heavy Duty, high performance, flexible soundproofing barrier from Thermotec Australia. 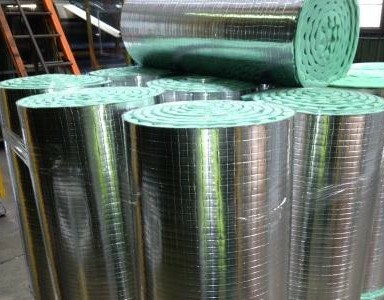 With an ultra thin profile of 3mm (approximately) and high acoustic performance of Rw 29*, 6kg/m2 Mass Loaded Vinyl is an excellent product for use in soundproofing projects that require and extra degree of soundproofing. Particularly in walls, timber floors and ceiling spaces in home theaters or Sound Studio’s. Mass loaded Vinyl is also commonly used in a wide variety of other applications such as soundproofing cars, boats, pump housings, machinery rooms or other industrial applications. Mass Loaded Vinyl (MLV) is dark grey or black in colour and Supplied in a roll, 3 meters long by 1350mm wide, weighing approximately 24kg. 6kg/m2 Mass Loaded Vinyl is very easy to cut and install. The product contains a fabric scrim with an embossed face increasing tear resistance whilst maintaining high flexibility. 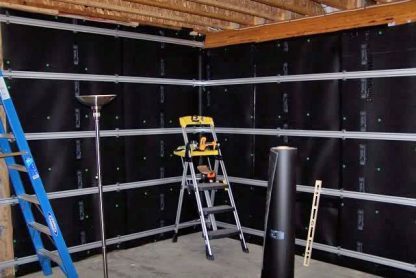 Walls / ceilings / underfloors – the product should be tacked to studs / joists using tacks with large heads or incorporating a washer to minimize tear. Gluing is also beneficial. 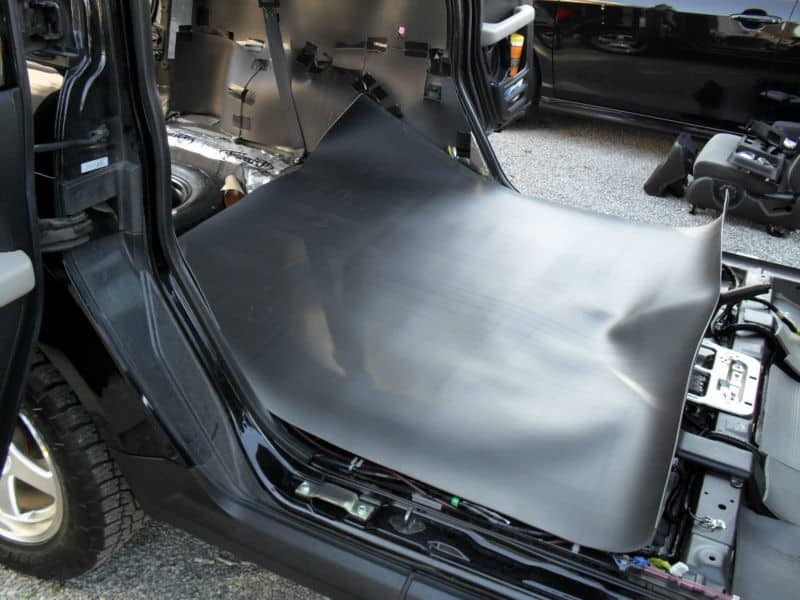 Mass Loaded Vinyl (MLV) can be glued to machinery housings, pump housings, boat or car structures to increase the mass and reduce sound transmission. Sheets should be butted up against each other, or overlapped and taped using a a strong industrial tape. Mass Loaded Vinyl is comprised of 3 elements. First, vinyl is employed to provide the product with a high level of flexibility for ease of use. Second, the Vinyl is impregnated with naturally occurring Barium Sulphate, a non toxic nature and high relative density substance. It is this high relative density (mass) that gives Mass Loaded Vinyl such effective soundproofing capabilities. *Rw rating is a single number quantity summarising the transmission loss of a material over the frequency range from 100Hz to 3.15 kHz under AS/NZS 1276.1:1999. Independent test reports available. Want to know more or have a question? Simply contact us below and we’ll do our best to help.